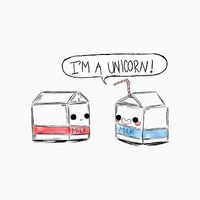 So, you can feel how you want about this, but to my knowledge this is the 100% Unicorn Milk. It started with a friend wanting a “clone” of it, so as most people do, I went and used the recipe of ELR. I’ve read through all the comments on there, blah, blah. I’ve mixed it before, and its good, and fairly accurate to the original, my local shop carries it so I tried side by side. But, just like many pointed out, I found that CAP Butter Cream was not out at the time that this recipe would have come out, so I figured I would try my hand on it. I started my search making some assumptions. I assumed that CWS had the percentages correct, and the only thing wrong was butter cream. So then I thought to myself, maybe its a different butter cream? So I went and got the only other one that would be out at the time, FW. I used it, steeped it for a time, and the cream tasted a little closer but something was still off. I know the vanilla custard is in there, I can taste that anywhere, and sweet strawberry is unique and high enough to know that was in it for sure. The only other things it could be was cheesecake, sweet cream, and the graham cracker. I then made the sweet cream switch to tfa and fw, and neither was close to the original, so I kept it. The presence of NYC is very prevalent in a lot of S&C’s so I kept it, its not “noticeable” that low, but it provides a cream/dept. The last one was the graham cracker. It wasn’t tfa original, and when I tried tfa graham clear, it didn’t taste like the original as well. I went with FW and I felt that it worked. I told my buddy that I felt I had figured out the changes, and he said “lets see” and called someone up on the phone there in the shop. He told him he had a friend that thinks he figure out UM and the guy said “If he reads off the ELR recipe, I’m just going to hang up”. We read this off and all he did was chuckle some, and said “I wouldn’t change a single thing” Apparently he is someone that had left the company a while ago, that knows the recipes. My buddy is someone I’ve known for years, and feel he wouldn’t just randomly call someone up, especially since I just walked in and said I finished it, and without hesitation called the guy. I feel he wouldn’t lie. So at this point, I feel my mix is spot on with the original, and to the best of my knowledge, was confirmed by an old employee. So the CWS was close, but not close enough as far as I’m concerned. I let my mixes sit a month before ever trying them, so I could compare to bottles that have sat in shops. The custards and creams probably come together at the 2 week mark, but I would say a month to be honest. I have not tried Unicorn Milk, but this is the best tasting juice I have ever vaped. In-f'n-credible! Great job Slasha! This is as close as you can get to the original. Really nice work! So, hit this up at two weeks, and it was damned good. by the time 3 weeks rolled around, it was better. It's been a month. This stuff *is* Unicorn Milk. Not a question in my mind. You straight knocked this outta the park. Thank you for nailing it. I have to agree with Freshepies on this one, this has to be the closest representation that I have ever had to the original. It was a nice bit of nostalgia as this was one of the first e-liquids I tried when I started vaping. Excellent work. This is dangerously close. The FW graham takes away the hit of spiciness that the clone had. Great work, it certainly is about as spot on as I've run across. The FW Butter Cream is certainly the right choice here. All of the familiar notes from Unicorn Milk are there even off of the shake and vape, but the added sweetness from FW pushes this right into the right place. Well done Slasha! It certainly tastes like you've cracked this one wide open.